Hey there friends! 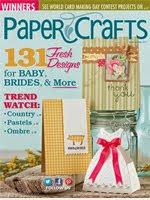 Thank you for stopping by Paper Craft Magazine's Card Design Handbook! This special issue is DEFINITELY one you need to add to your collection! You're going to find all the major design principles and fundamentals of art easily explained with helpful tips and ideas to make your cards go from good to GREAT!! As an art teacher who teaches the principles found in this special issue to my students, I was so excited to participate in an issue that applied these principles specifically to paper-crafted products! 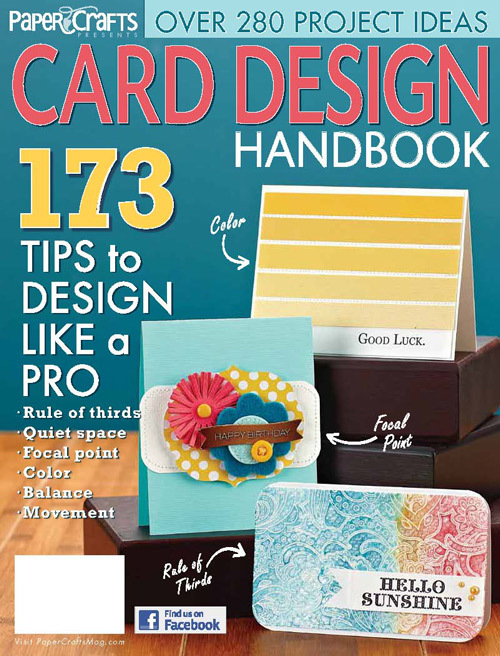 One of my favorite features of Card Design Handbook were the good-to-great cards found on pages 9, 34 and 66. Two cards are presented that are exactly the same, except one follows the design rules found in the Card Design Handbook glossary, which you can download for free, that makes the card design go from good to GREAT! Hard elements are found in the lines on the patterned paper and the washi tape. The tape has been trimmed with decorative scissors that also create a hard line. Other hard elements are the pearls and embossed detail. While this card has some pretty, soft flowers, it does seem "unbalanced" according to the hard vs. soft rule. Balance is achieved in the "GREAT" version of this design. 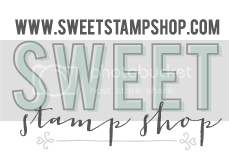 By adding some soft polka dot ribbon trim and adding some stamped leaves to the card, the design finally feels like it's achieved balance and has gone from good to GREAT! 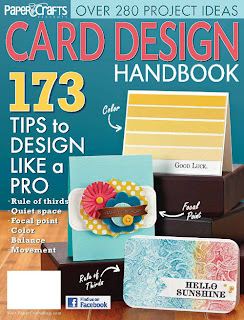 Make sure to stop by the wonderful ladies' blogs who are participating in this hop, and leave a comment for your chance to win a copy of Card Design Handbook. 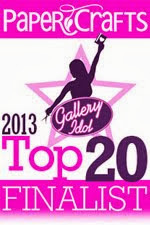 I will pick a winner on Tuesday, August 28th, so leave your comment on my blog before then! Your next stop is the lovely, Vanessa Menhorn. She creates such elegant projects, so you're in for a treat! What a great explanation of balance! I think this is one of the major issues with my cards. Thanks for demo-ing the fix! Fabulous card! Love the washi tape. Thank you for illustrating this principle. I will try to apply it too. Gorgeous card! Love your style! What a pretty card. I really like the stamp and colors. Thank you for the opportunity to win. I'm now following your blog. you have some wonderful projects! Great cards!! THanks for the chance to win!! Oh - love the soft and pretty addition of the ribbon! Definitely ups the "WOW" factor!!! Love the Rosie Posie set, well done with the inking. I am loving the free lessons this week. Thanks for sharing with us. I love the colors in this card. The card certainly looks great. The rounded corner and ribbon really add net rest! Wow - The ribbon really makes a difference! I need to remember this - thank you! Both cards are fun and whimsical! The big bow does add a sense of fun too! I really like the additions. Both beautiful cards. Love the lesson, really helps to show the difference going from good to great. Thanks for sharing!! A new rule for me - thanks for the delightful example. Beautiful!!! I have not thought of the balance of my card being hard or soft! Thanks for sharing!! The repeat of the dots on the ribbon perks everything up! Seriously, Emily, I'm in love with both cards! The ribbon and leaves took it from Already Great to Even Greater! :D The colour combo you chose is so fresh and gorgeous, too -- Beautiful!! Great example and beautiful result! Thank you. Amazing how just some ribbon adds so much to a card. Beautiful card. Just an amazing lesson in what a couple additions can do. I never heard of a card being hard or soft before. Very interesting! & it also makes the card much more interesting. The second card is SO fun! 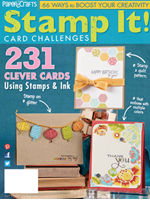 Love the ombre stamping too! This week has been a learning treat for me! I actually thought I knew quite a bit about making cards...HA! I want this issue!! I need this issue!!! I love your addition of the ribbon. But I liked both cards too! 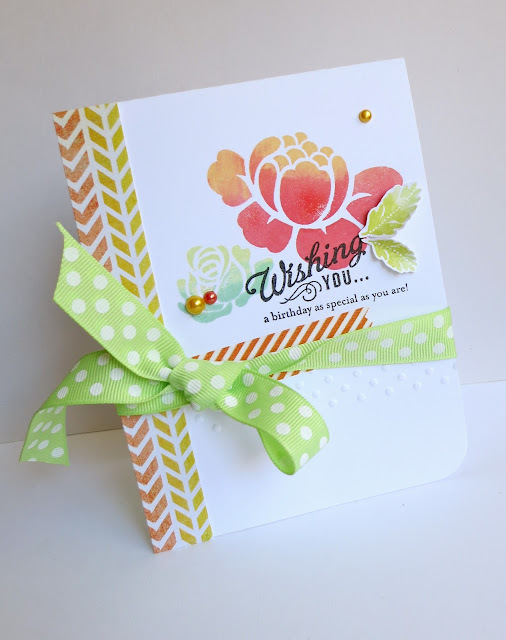 Pretty card, I like the green polka dot ribbon. Oh yes! The ribbon and leaves balance the green already on the card, polka dots repeat the embossed dots - just an epic win! Thanks for the inspiration! What card isn't made better with a little strategically placed ribbon? ;-) The added leaves really made a difference, too, though the 1st card is lovely, too. Thanks for participating in this great week of VERY helpful lessons. I had not heard this rule before. Thanks for sharing! Oh wow, love the variegated look on the flowers! Oh my! I loved the first card. Then I saw the second card and the ribbon added so much. The leaves popping out and the ribbon added a lot of dimension. What a wonderful example of how to add a little extra to your card. Thanks for sharing. I love to use ribbon...thanks for making me aware of the rule of hard and soft! Yes - the second card is better... but I like them both. The addition of the greens does balance out the card. Hard and soft...what a great combo! Love this card! Wow. Just a little ribbon and what a difference. Very pretty. Thanks for the illustration. Love the added leaves and bow to the second card!! So pretty. Love the color combination! Amazing what a difference the ribbon and leaves make--seems to make the flower design just pop! Love your cards--now I know why I'm such a "ribbon" junky! Thanks Emily for sharing the hard and soft rule. This is one I have not heard of. I really love both cards but I do like the second one a bit more. The ribbon and leaves do add more softness. Thanks for the lesson learned and the fabulous examples. I really like both cards, but I guess I can see how the second one is a better design. I think I really need a copy of this Card Design Handbook to help me learn better techniques. Thanks for the chance to win! I love to put ribbon on my card too. Way to go. Thanks for the informative illustration of the hard/soft design principle. It is amazing how adding the ribbon and leaves changed the balance of the card! I feel like I've spent an hour reenergizing my artistic soul. These before and after projects are simply eye opening and jaw dropping! Such great cards...both of them! Beautifully done! Your explanations help so much - thanks for sharing! I always like to use ribbon on my cards and this is lovely! What an amazing difference! They are both gorgeous cards, but the seeing the second was an "ah ha" moment for me! Great tip, thanks so much! It's amazing the difference a few small additions to a card will make. Emily thank you for the great example of hard vs soft. This is an area that I really need to improve, I tend to avoid the "soft" elements like ribbon and I am sure I can improve my cards a lot once I learn to incorporate more "soft". Thanks for the tips about balance and softness. I recently discovered your blog and love your style. I like cards clean and simple, and I think the ribbon takes it just a little over the top. Great colors! Great projects! I always get such fun ideas from these blog hops! Gorgeous! The elements on the first one rely dis-jointed, but adding the ribbon pulled it all together. Love this lesson-I had not heard of it either. The addition of the leaf and ribbon moves the card to the "stunning" category. love the softness some ribbon and leaves makes. I don't know the hard line rule but will be reading about when I can get a copy of the magazine. I think both cards are beautiful, adding the ribbon is a nice touch though. I find it interesting that the pearls are a 'hard' element -- I would have guessed from their shape and colour that they were soft. But I certainly see what you mean! Great example of a good-to-great card! The little leaves do add a lot of character. The bow and leaf definitely balance it out! Great additions! I have a bit of trouble with this one. Because I like the first card more! Sigh. Guess I'll just have to win and see some more examples to help me understand better! This should be "great" and "great." ;) Both cards are super gorgeous! I love your style. what a fabulous card and so many great elements! Great cards, love the second one. The first was good, but when you see the other one ... wow. Thank you fo rsharing and a chance to win. I liked both the before and afters but the after definitely looks better! The softness really improves this card. Thanks for showing us great examples between hard and soft elements on a card. FAB! Thanks for sharing your beautiful balanced card. What a great concept. Thanks for the chance to win. This is the one tip I need to "study up" the most on. Thanks for sharing it. I have to agree good to great. Thanks for sharing your idea. The ribbon sure did balance it out. Love it. I love layers and this is a great example of the difference it makes! Thanks for sharing your beautiful cards! Thanks for another great lesson. This blog hop has been wonderful. Thanks! Wow, what a difference some soft elements make! Thanks for sharing this rule, it's new to me, I'll try to think about it next time. Your cards are lovely, love the effects with colors. Another fun lesson. Like yin and yang...hard and soft. Fascinating lovely card. The leaves make a huge difference! Love the green ribbon, too! 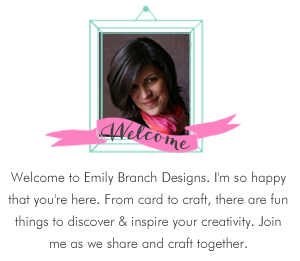 The ribbon really adds more softness to this card, Emily! Great example. The ribbon and leaves really add a nice touch. 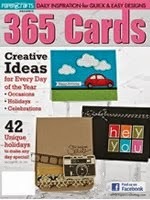 great card, colorful and fun! Beautiful! The addition of those two simple things makes such a difference! Thanks for the lesson! I SOooooo need that book! Just LOVE your second card!! I can't believe how much difference those leaves and ribbon made. Very pretty and thanks so much for sharing. Love the bit of green! Perfect touch. I wouldn't have thought of the improvements you made, but they really work! Especially love the feel the little leaves give the great card! I think that I have this problem a lot with my cards but I don't know that I would always change it to make it softer, this really does work great. thanks for sharing. I really liked the first one, and then I saw the second one! Wow, amazing difference, and so much better. I will need to think about this principle and try to incorporate it into my card-making. So much to think about! talk about on trend...a little neon, a little washi, a little PTI equals a WHOLE LOTTA awesome. I was checking out your blog and you tie your bows so interestingly....like your own little signature on a card. Wow, love what a difference the bow makes! Beautiful! 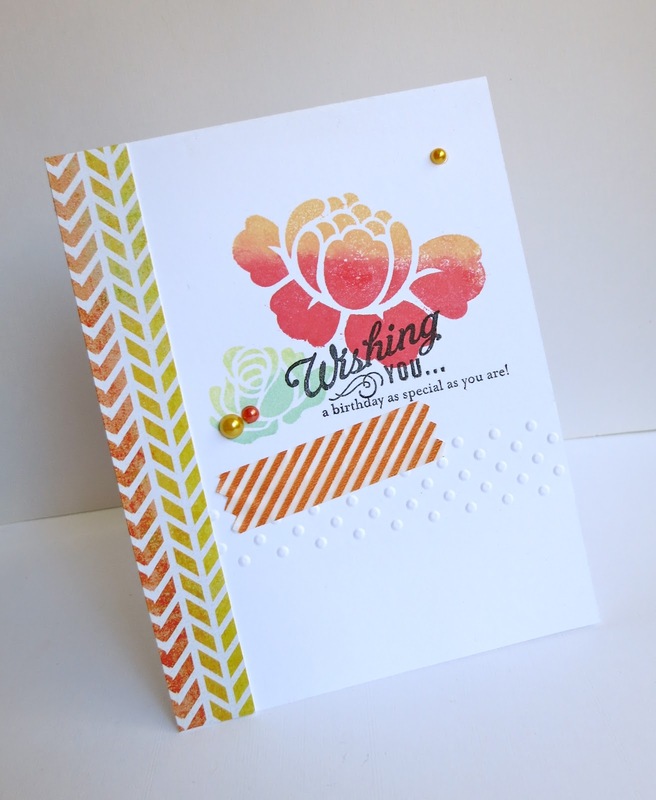 WOW, the polka dot ribbon adds the perfect touch to an already gorgeous card,Emily! That second card is a stunner! The rounded corner and ribbon really give it pizzazz! Wow! That was amazing! Thanks for sharing your cards with us. Both cards are very energetic, love 'em! What a great post. I really 'get' it! What a great post. I really get what you mean! Emily, both of your cards are absolutely gorgeous but I can see how applying this rule of balance makes such a difference! Thanks for all the information and tips! love the addition of ribbon on your second card. very pretty! Amazing what a different adding the ribbon and leaves makes in balancing the hard/soft elements on your card. Now I understand. Thanks! Love these cards, Emily! The flower is so pretty! Amazing the difference with such a small change. Very pretty card. Thanks for sharing. I now understand this hard/soft rule. I'd really love to have this handbook as a bible in my room. Great example of design balance. Colors are nice and I do like the additions to the second card. Thanks for the tips. beautiful card. great lesson! thanks for sharing! Lovely card, Emily! I love the polka dot ribbon! Beautiful card!!! I love how the ribbon soften ups the look of the card and makes me want to linger on it!!! Fabulous example cards! This is something I didn't know anything about. Thank you! I've never heard this principle before but I think my eye knows it. Beautiful card(s). Thanks for the lesson. What a neat way to spice up your card! Thanks for the great idea. gosh i love this card. the colors are so pretty together. 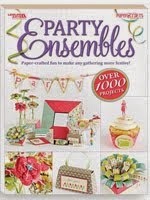 I love how many different elements are on it but it still looks so great and they all play so nicely together. tfs. This will the hardest thing for me to learn.I'll probably have to visit this blog entry frequently to get it! Thanks for the lesson! I can see the difference with just a minor change. Beautiful card! Ok, I like the "great" card better but may need a lot more help in thinking this out.... I just tend to wing it, but you go girl! What a cool lesson, thanks!